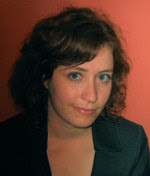 Continuing my series of interviews with Web Analysts, here is an interview with June Dershewitz. VP Analytics at Semphonic, a leading web analytics consultancy based in the San Francisco Bay Area. Tell me about your work, education prior to entering Web Analytics. I have a BA in Mathematics from Reed College in Portland, OR. After college I spent 4 years as a research assistant for a mathematician at Swarthmore College in Philadelphia, PA. In 1999 I moved to San Francisco and got my first job as a web analyst at a startup. I've worked in web analytics ever since. Most recently I spent 3 1/2 yearsas an independent consultant, taking project-based assignments at companies throughout the Bay Area. I started a new chapter 5 months ago when I joined Semphonic as a salaried employee. Why did you decided to move to Web Analytics? It was a brand-new field when I fell into it in 1999. Back then I aspired to be a web developer, but my future employer saw my affinity for data analysis and offered me a position as a web analyst. I took the leap, and I'm so glad I did. How did you like being an Independent Consultant? How did you find your job at Semphonic? I met Gary Angel in May 2007 at eMetrics in San Francisco and I joined his team at Semphonic 3 months later, in August. I think we both knew from the start that I'd be a great fit at Semphonic; it was just a matter of getting the ball rolling. My path to Semphonic was not your typical, "see job posting, write cover letter, get interview" progression. I've found that, as I continue to build experience and connections in this field, my approach to career growth is evolving. I'm not going to say it's all about who you know, but I'm definitely in favor of leveraging connections to make progress. What are you responsibilities in your current position? Describe your typical work day. I live for variety, and I certainly get that variety at Semphonic. I am fortunate enough to work with a great set of clients; every day I talk to one or more clients about the work at hand. Depending on the size of the project I'll work with a team or on my own to keep everything moving in the right direction. My current projects span the gamut of data analysis, measurement strategy definition, report development/automation, etc. I also talk to prospective customers now and then, write project proposals, write for my blog, and confer with my Semphonic colleagues. One of main reasons I joined Semphonic was so I'd have the chance to work collaboratively with other top-notch analysts, and I have found that opportunity very fulfilling. Curiosity and enthusiasm. I know these aren't skills so much as innate qualities, but I believe if you can go a long way as a web analyst with curiosity and enthusiasm. If you are genuinely interested in what you're doing, it shows. What, if any, education or work experience helped you in Web Analytics? As much as I love the study of mathematics, I don't often put my academic background to use in any direct sense. On the other hand I know that math has given me a good analytical foundation: a general level of comfort with numbers, solid problem-solving skills, a fine sense of logic. On paper I believe it's helped me get ahead a few times during the job-hunting process; a number of interviewers have mentioned that I'd been given preference because of my math degree. I feel lucky but I also find this frustrating because I know that great web analysts come from a diverse array of educational backgrounds. What education you feel is lacking, education or experience that would have helped in Web Analytics? When I entered the field of web analytics it was squarely planted in the technical realm, and over time it's become part of marketing. I've picked up quite a bit through real-world experience, but if I was starting over from scratch I'd definitely take formal coursework in marketing. Actually, these days I prefer to do my reading online rather than in print. I am drawn to blogs because they're so fresh, candid and diverse in opinion. I have about 80 blogs in my feed reader right now; some are specific to web analytics, others are in related specializations, and some cover the web industry in general. I try to keep up with my reading every day, but if I get behind I'll skim the content from frequent posters and focus on the bloggers who post just a few high-quality articles a month. Also, I've just started using the Google Reader Shared Items feature and I've found that it's a great way to discover new blogs that my friends are reading. I face the challenge of wanting to be a specialist and a generalist at the same time. I think, as a consultant, it's desirable to have a broad range of skills, but I also know that it can be valuable to pick a specialty and stick with it. I believe you've done a great job of it, Anil, with your specialization on behavioral targeting. Naturally I focus my learning on topics I find personally intriguing, but I'm also on the lookout for areas of study that will open up new career opportunities in the future. Ultimately I intend to have my skills evolve in the direction I want my career to go. Tell me about your blog. What kind of article do you write? How much time do you spend? How do you measure success of your blog? I started my blog a few months ago; you can find it at http://june.typepad.com/. My cardinal rule is that I'll write about whatever I find interesting as long as it can be directly related to web analytics. Last month I posted a picture of my family's pet chicken - but really, it was still on-topic. As a new blogger I had no idea how much fun it would be to get comments on my blog posts. The comments, the personal feedback, the new connections - that's how I gauge success and that's what keeps me going. What do you look for in a candidate when you hire? As I mentioned earlier, curiosity and enthusiasm. Show me that you really want to be here, that you're truly interested, that you're motivated by more than just a paycheck. If you're not yet certain you'd enjoy the work, conduct informational interviews with people who are in positions you'd like to attain. Ask them about their career, what they like about it, what they don't, what they think is challenging, etc. By all means read the interviews Anil has compiled here - but also be sure to talk to people on your own. You'll wind up with valuable insight and new friends, too. Bounce Rate Survey - Needs your input.Please take few minutes to fill out a small survey on Bounce Rates. I will publish the results on this blog. Take Bounce Rate Survey. A user of web analytics yahoo group asked if there is a way to show visitors IP address in Google Analytics (GA). Google Analytics does not allow you to see Visitors IP in any report. I created a Custom Filter to grab Visitor IP and put it in “User Defined” visitor attribute. “User Defined” attribute is then shown in “User Defined” report (Figure 1 and Figure 2). This attribute can also be used to segment some other reports (Figure 3). Click on “Edit” next to the profile for which you want to create the filter for. Select “Visitor IP” from “Field A -> Extract A” field drop down and enter (. *) in the field next to it. What this is telling GA is to select Visitor IP and extract all of the content into a temporary variable called A. Select “User Defined” from “Output To -> Constructor” and enter $A1 in the next field. What this is telling GA is that take the first value from A (hence $A1) and put it into “User Defined” variable. This will then show up in “User Defined” report. Select “Override Output Field” to Yes because you want the new value to replace anything that might be there (also note that “User Defined” attribute can have only one value). The above steps create the filter and will be automatically applied to the profile that you created it for. Since GA allowed me to choose Visitor IP and create a filter my first reaction was that it should work (not knowing that GA does not store IP). I should have got a hint when I did not see any results and went back to edit my filter. The filter screen had wiped out my selection of Visitor IP in field A (see below). Google Analytics will mature further and start taking customers from other analytics tools like Omniture, WebTrends, Clicktracks etc. The configuration will become little complicated (and hence need for Google Analytics Expertise will grow) and Google will also expose more APIs to allow companies to pull and merge different kinds of data with Web Analytics Data. Considering, if what I predicted will indeed come true then it is time to start writing about the lessons I learn while configuring Google Analytics and share my experience so that others can learn from my success and mistakes and also share their experiences. Have you done custom configuration in GA? Would you like to share your custom configurations? How you created them, what worked what did not etc. If yes, please send me an email and become a co-author on this blog. I will be doing a series on Google Analytics configuration and the lessons I have learned. Continuing my series of interviews with Web Analyst, here is an interview with Wandering Dave Rhee also known as WDave. I've been involved with Web Analytics directly for a few years now, before which I was working on creating new metrics for the financial valuation of social networks. Discussion boards and other online communities, specifically. Tell us about your work, education prior to making a switch. I've held various positions in IT strategy consulting, network engineering, and a handful of other varied roles -- check my LinkedIn profile if you're really curious. (http://www.linkedin.com/in/wdave) My background includes a bachelor's degree in computer science and organic chemistry, an executive MBA, and a Ph.D. in MIS (that I'm still working on -- my dissertation topic focuses on social networks, as mentioned above). Web analytics was a natural extension of my earlier research -- how do people behave on the web, and what methods or processes are available to influence that behavior for a given purpose, such as eCommerce or online marketing? Most social network products and services today are about generating buzz or "viral" marketing (which is a widely mis-used term), but I believe that as the true value of social marketing emerges, the demand for solid, actionable metrics will also increase. And I think web analytics is the most likely place for that need to emerge. How did you find your new job? How long did it take? Did you interview a lot? Like most people in most circumstances, I found my first job in WA through various social networks, and just searching job boards. At the time, I knew little about web analytics, but was fortunate to have been "found" by a manager who recognized that I could be "trained" for the role quickly and easily, so it worked out well for everyone involved. My current position I found through meeting people at Jim Sterne's eMetrics Marketing Optimization Summits(http://emterics.org/) -- there is no better place to meet prospective employers or employees in our field, I'm quite certain. As country manager, I assist with business development, but also help other team members in other countries with their ongoing consulting engagements. This means assisting our clients who could be anywhere in the WA lifecycle -- from those just beginning their needs analysis, to those looking to change analytics service providers for various reasons, to those who are trying to get to "the next level" of really managing their online spend as one aspect of their overall marketing portfolio. Web analytics seems to be the cornerstone of marketing optimization, and with good reason. Web analysts generally have the right mindset to ask questions based on business goals, not merely on gathering data for its own sake. Analysts work at various levels -- the most fundamental level requires some understanding of basic statistics, such as linear regression, seasonality, and simple trend forecasting, combined with an understanding of how the web "works." In other words, what do we know about browsing behavior, combined with cookie deletion probabilities, web server caching, and other artifacts of the web experience, to put our data into a reasonable context, from which we can draw useful conclusions? Beyond that basic level, though, is an understanding of organizational politics, and some fluency in "managing your message" so that the analysis you've worked hard at creating actually influences managers in making better decisions. Otherwise, you're just creating "doorstop reports," that don't help your organization, and don't really justify your efforts. Demystified (http://webanalyticsdemystified.com/job_list.asp and the Web Analytics Association's own job board (http://www.webanalyticsassociation.org/en/jobs/search.asp) are the two best places for those on either side of a job search. All the "classics" -- but the ones I refer to most are actually ones with Excel tips and tricks. Analytics is a mindset, and a set of lenses through which to view business data. Once you've learned to look through those different lenses, and had your "Aha!" moments, you continue to hone your analysis in other ways -- creating more compelling presentations, for example, to increase the decision-making influence of your analysis. I think the entire industry is at a point where our ability to analyze goes beyond the ability of the tools to deliver unified data in a cost-effective manner. In other words, we can imagine many different data sets we'd like to correlate, but only very few of us can get the various data sources to play nicely with each other without spending an inordinate amount of time, effort, and money, most of which we don't have access to. Beyond that, most organizations aren't yet at the point where they know how to take advantage of the insights web analytics, or rather, an analytics-framed mindset, can offer. As a consultant, I see mos firms struggling to implement a tool correctly, and after that, maybe to figure out some truly useful KPIs, then do some basic campaign analysis. Few organizations are at the point where multi-channel measurement is common, or where web analytics is used to help allocate marketing spend most effectively, or where true ROI is being captured, and good business decisions made accordingly. Web analytics will mature as an industry, but part of that means that the skill sets will become better defined and more widespread, so that any firm that really needs an analyst will be able to hire one. Beyond that, web analytics and business intelligence will merge in terms of an aggressive approach to data analysis being applied to many areas of an organization -- not just their web site, or even their online marketing, but all of the marketing, production, sales, and other operations. It's neither easy nor cheap to get there, but I'm sure that those firms which can execute well on an analytics vision will certainly see unparalleled success. I'm a little biased here, but as someone who reads nearly every message in the Web Analytics Forum (the free Yahoo! Group that Eric T. Peterson founded, and which I now serve as the primary moderator (http://tech.groups.yahoo.com/group/webanalytics), I'd have to say it's one of the best ways to stay abreast of what's going on. blog, their blogs, or in the Web Analytics Forum. Some things also get posted to my personal blog, http://influenceanalytics.com/, particularly analytics for social networks. Join the Web Analytics Forum, read the archives, and keep current with what people are asking about. Join the Web Analytics Association, and support your professional community by volunteering for a committee -- there's no better way to get to know some of the most influential people in the industry than by working on a project with them. And of course, attend an eMetrics Marketing Optimization Summit (http://emterics.org/), get to know your peers, chat with some of the brightest minds in the industry, share your fresh perspectives with others, and quite possibly, walk away with a dream job. This is definitely one of the most comprehensive reports I have seen on this subject. Whether you are new to web analyst or a seasoned web analytics professional this report will help you. The report covers basic information about web analytics, current methods of data collection and describes business case for web analytics. Then it provides an in-depth review of the process to follow to ensure the successful purchase of web analytics tool. And finally it provides in-depth review of the various tools. In this report, you will also find that you have more choice of tools (based on your business needs and budget) than you might think. According to Phil Kemelor, "The web analytics marketplace has seen some instability and consolidation -- such as ClickTracks and SageMetrics being acquired by larger entities, and Omniture's imminent acquisition of Visual Sciences -- and this has led some to believe that web analytics has become a two-party system. But don't believe the hype that Google Analytics and Omniture are your only choices, because that's hardly the case." If you are looking to buy a web analytics solution then my recommendation is to start with this report. This report will prepare you with the questions that you might not normally think of to ask the web analytics solution providers. In my years of experiences I have seen several cases where a company invests in a tool without understanding fully what they are getting into in terms of functionality, support, Total Cost of Ownership (TCO), licensing agreements etc, this report will provide you the required information so that you can avoid those pitfalls and make a sound investment decision. The report will pay for itself on the very first day. Bounce Rate Survey - Needs your input. Please take few minutes to fill out a small survey on Bounce Rates. I will publish the results on this blog. Take Bounce Rate Survey. Behavioral Targeting has become the buzz words these days. Behavioral targeting Vendors are spreading like wildfire. It is become hard to keep up with all the vendors in the market and find out who is tracking your behavior. Even though most of the time tracking is done anonymously, using a third party anonymous cookie, Behavioral Targeting has raised privacy concerns. Most of the time these privacy concerns are unfound but still there are chances when it they can become an issue. To ease consumers concerns and give them control over their tracking, Network Advertising Initiate (NAI) has developed an Opt-out Tool. This tool allows consumers to see what Advertising networks have dropped cookie on their computer and hence are tracking their behavior. If a person does not want any network(s) to track his/her behavior the visitor can "opt out" of the network using this tool. Opting out of a network does not mean a visitor will no longer receive online advertising. It does mean that the network from which a visitor opted out will no longer deliver ads based on the visitor’s behavior and/or preferences. One caveat is that opt-out (using this tool) is based on third party cookies. What that means is that third party cookies are dropped on a visitor’s computer from the networks that he/she opt-outs from. 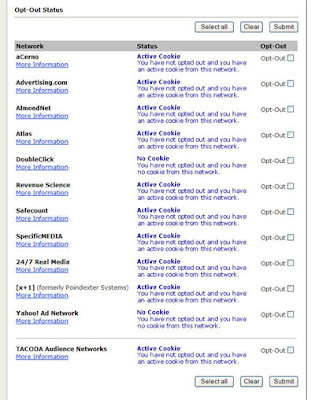 When the visitor visits a site that is part of the network, network code reads the cookies and if it finds an opt-out cookie on the computer then if does not track or show targeted (behavioral) ads. If the visitor deletes the cookie or uses a software which deletes the cookies then visitor will be automatically opted-in again and he/she will have to repeat the process of opting out. I believe that NAI should push this initiative even further and allow consumers to opt-out directly from the ads that are being served based on behavioral data or from the sites where the data is being collected. I am predicting that this year we might see a push in that direction. I also believe there will be opt-in networks instead of opt-outs (I wrote about my proposed solution when discussingGoogle DoubleClick privacy concerns, networks that will allow more control to visitors and reward users for participating in these networks (something similar to MyPoints, which asked for your preferences and then emailed you offers or ads based on those preferences and then rewarded you for clicking on those email offers). Here are the networks that are part of NAI (I will write about these networks in future articles). Here is the screenshot of the tool. To use the tool visit NAI Website. I tested it on two computers and was surprised to find out that I did not have network cookies from DoubleClick and Yahoo ad networks on either of the computers. I don’t believe that. So I don’t think the tool is fully functional, I will test various network in few days and report back if I find anything odd. For now, I have left all my cookies as it is because I find the value in behaviorally targeted ads, I will only opt-out for testing purposes. When you guys try can you let me know if you are seeing the same thing? Have you wondered how the bounce rare of your site compares to the others in the same industry? After I wrote the blog post about Bounce Rate I got several emails asking me if I had data or info on the bounce rate in their industry. Here is your chance to participate in an effort to collect bounce rate and conversion data. Please take few minutes to fill out a small survey. I will publish the results on this blog. Note: Here are the results of Salary Survey, that I conducted last year. Should you be paying for the clicks on your brand keywords? When you do a search on your brand name or your company name, chances are that you will have you company’s site listed as the top organic result. If it is not then you should first learn about Search Engine Optimization before reading this post (email me and I can help you with all your SEO/SEM needs). It is also very likely that there won’t be any paid listing on the SERP (Search Engine Result Page) when you do a search on your own brand name. If you do buy paid search listing, it is going to appear just above you’re your own organic listing. Is it a good idea to buy the paid listing and pay the money to Search engine for something you could have got for free (next listing after paid is also yours)? And visitor by searching on your brand name has shown their intent of visiting your site. If you use an agency, I am sure that your agency is already buying your brand keywords and showing you how good your conversion is on your aggregate keyword buy. Well if a consumer is already looking for your brand name then their intent is very clear, they are ready to be converted. A lot of users use brand keyword in search to get to a particular site, they use built in search functionality in their toolbars (Google, yahoo, msn etc) which then takes them to SERP of the toolbar provider. If a user is looking for your site and you know you will be number 1 in the SERP, does it make sense to buy a keyword? Isn’t it unnecessary? Won’t you be wasting your money? Some might argue that buying that keyword reinforces your brand name and your site in visitors mind and hence you will result in more click-through, visitors, conversion and ROI. But how can you be sure? That’s exactly what I am going to show you in this article. The first and foremost thing is to understand what value you are getting from your search marketing efforts, paid and organic. Once you understand the complete impact of both types of Search Marketing efforts you will be able to make an informed decision. A decision that will be based on your ultimate business goals e.g. increase site traffic, increase conversion, increase ROI or a combination. Here is my 5 step process to determine if you should buy Paid Search on your brand name keyword or not. Configure Web Analytics Tool: The first step is to configure your web analytics tool so that it can measure and report on the traffic for your brand keywords in 3 separate segments, paid, non-paid and total,. Below is a screen shot from Google Analytics showing paid, non-paid and total for a particular keyword. (I will not cover how to configure your tool since they all have different configuration. I will be able to help you if you email me). Develop Baseline: Develop a baseline for total traffic and conversion for the three segments (paid, organic, and paid and organic for your brand keywords). See how much traffic is generated by each segment and how much of that traffic is converting. Test: This is the crucial step in determining if you should buy your brand name keyword or not. If you are not currently running paid ad then this step is much easier than if you already have the paid search running. If you already have the paid search running, you have to be willing to take a chance to do this test. It might not work out in your favor but unless you try it you will never know. Stop the paid keyword for your Brand Keywords – Stop the keyword for time enough to generate significant traffic and conversion data. Start the paid search for your Brand Keywords - Start the paid search campaign for time enough to generate significant traffic and conversion data. Analyze the data: Let’s take a look at an example which will help you with analysis. You get 100 click throughs, 80 from organic and 20 from paid. * Total Profit on Paid Efforts = (Profit Margin on Conversion * Conversion resulting from Paid Search) – Total Cost of Paid Search. This calculation only uses CPC cost and does not include agency and other direct or indirect cost. Other costs associated with buying, placing and reporting will further add to total cost. So far, it all looks good, your paid search efforts are paying off and you continue to keep buying your own Brand name keyword. Now stop running the paid searches. Since there is no paid search listing, all of the 100 clicks (assuming same number of clickthoughs) will go to organic. Say now instead of 100 (that you got when you had paid search running) you only get a toal of 96 and rest of the 4 go to your competitor or somebody else who shows up under your brand name in organic listing. Paid search placements result in a total of 100 (from paid and organic) while only organic results in 96. Your cost per conversion from paid is $1.00 and you are making $20 in profit from your paid search efforts. It all looks good. Now, let’s take a look at the results in another way. *Assuming you have basic SEO for your brand keywords. As you see above you only get 2 more and not 10 conversions by participating in paid search. You only get 2 more conversion by paid listings and not 10 as paid listing report was showing. You got 48 conversions when you stopped paid listings and 50 when you used paid listing. So effectively you paid $10 for 2 more conversions. That is $5 per conversion not $1.00 as you agency might have reported on your paid search listing report. So in light of this information, here is your profit and loss statement. As you see above you have a loss of $4.00 instead of a profit of $20 on your paid search efforts on your Brand keywords. Note that above example in only for illustrations so you have to look at your own number and test them to see if you are making or losing money. As I showed above this issue is really significant on branded keywords but you should apply the same login to your non-branded keywords too and see if you are losing money or making money by participating in paid search. Please send me an email if you would like the excel sheet for these calculations so that you don’t have to recreate it. Also email me if you would like a PDF version of this post. Here is an example where, I think, the company is losing money by buying their own brand keyword. They should probably file a complaint with Google to not sell their brand name to the ToyRMall (listed on the right hand side sponsored listing) and not but their own brand name keyword. Most of the listings on the first page of SERP point to ToysRUs site anyway. So are you wasting money? Chime in. Even though I have written about the brand name keyword, you should do this exercise with your top keywords to make sure you are not losing money. Note: After I had written this post, I found out that Gary and Gary had also written post on this same topic (Thank you Jaimie Scott, for sending me these links). Understanding time spent of site - I have come across this KPI over and over again. Many of my clients want to report it on frequent basis and some even have this as one of their goals for the site. However, I am surprised to find that not many people (not even a lot of web analysts) understand how this metrics is calculated and what this is actually reporting. This post explains what time spent on site or a page means and how it is calculated. Referring Domain Demystified - This two part series explains how referring domains are reported by the web analytics tools. What causes high or low bounce rates? Are you doing Web Reporting or Web Analytics? – This post clears the confusion between Web Reporting and Web Analytics. Books Recommended by Web Analysts - If you are starting a career in web analytics or are already working in this field but are looking for some good reads then this list is for you. Please note that this is not a list of recommended books by me, these are from the analysts I interviewed (except for Competing on Analytics). I have not even read most of these books yet. Targeting Cart Abandonment By Email - This post provides some steps that you should include into your process for using email incentives when you target users who abandon shopping cart on your site. What does Website Optimization mean? - Depending on your role in the organization you might have define Optimization which might not be the same as somebody else in a different role. The people responsible for different pieces of website optimization do not understand the complete picture and are locked in their own definition of website optimization. This article explains what optimization means. Do you really need a home page? - Home page has long been the focus of attention of most of the marketers. But should it be? This post shows you how you might be missing on a huge opportunity by focusing on just the home page of the site. 10 steps for measuring online advertising success – This post shows my 10 steps process for measuring the online advertising success, nothing fancy, a simple straight forward process that will improve your bottom line. Relying too much on SEO? Think Again. - A lot marketers are getting too obsessed with traffic driven to their sites from Google, Yahoo, Live (MSN), ASK etc without thinking about the consequences of dropping off from search engines rankings. I understand that it is relatively cheaper (notice I did not say Free) than paid inclusions, banner ads, affiliates etc. And ranking high on search engine is something to be happy about and proud of, ranking high on search engines provides you competitive advantage. But Free comes with risks. Follow the Search - Search is a powerful (relatively free) way to generate site traffic. However it also results in huge bounce rate, this article talk about a simple way to engage these users and decrease the bounce rate which increasing the conversion. Last year I made 5 predictions about Web Analytics and Behavioral Targeting. I was pleased to find that all of them came true by the middle of the year. Google Analytics – Google Analytics will mature further and start taking customers from other analytics tools like Omniture, WebTrends, Clicktracks etc. The configuration will become little complicated (and hence need for Google Analytics Expertise will grow) and Google will also expose more APIs to allow companies to pull and merge different kinds of data with Web Analytics Data. Mobile Analytics – Mobile sites and mobile advertisings gains momentum. Mobile Analytics will be become a requirement to understand how the sites and advertising is performing. Currently you can either use log files, WAP gateway logs if you are one of the mobile carriers (this is what I did back in 2001 -2002) or use services from Amethon. This year we will see more players in mobile Analytics. The reporting will become better than what has been offered to date. Online and Offline Data Integration – A need for integrating offline data and web analytics data will become a priority. ZeroDash1 founders saw this need in the market and hence started this company. More companies will push in this direction including web analytics vendors. Oracle bought a Web Analytics companies (I predicted this also). I can see them integrating CRM and Web Analytics into one package. Opt-in system – Some networks (maybe new ones) will move towards opt-in rather than opt-out (I favor opt-in over opt-out as I wrote in past. So I am making this prediction that this year networks will pay attention to it). A new types of networks or services might come up which will allow users to be an active participant in BT and control who can use their online behavioral data and how they can use it. Amazon and ToysRUs sharing visitor behavior data? Just before holidays a colleague of mine asked me if Amazon and Toys"R"Us were involved in behavioral targeting. He told me that he did search for Lego on ToysRUs and few days later when he visited Amazon, he saw Lego featured on the home page. He said that he had never did any search for Lego on Amazon. I looked at the code on ToysRUs and did not find anything that looked like it is sharing data with Amazon. To see if there was any data sharing going on I decided to give it a try myself. Before I did anything I went to Amazon and made sure there were no Lego related products on the home page, they had recommendation and featured products for me but none of them were Lego. I refreshed the page few times to make sure I am not missing anything. Then I went to Toys"R"Us, did Lego search and came back to Amazon but nothing there. I visited Amazon for next few days but nothing there and I forgot about it. After holidays my colleague again asked me about this issue. So I checked again and voila this is what I saw. Not sure if this was a chance or really there is some data transfer going on between Amazon and ToysRUs (they both are Partners I think). Again, I am not sure if there is any data sharing going on or not but me and my collegue noticed it so I decided to write about it. It is very likely that Amazon was just promoting Lego and had nothing to do with me searching those on ToysRUs. But knowing how Amazon is so advanced in personalization and targeting there seems to be a mini behavioral targeting network between Amazon and ToysRUs. Additionally, I have never ever searched for Lego on Amazon (even on any other site) except for this time when I was doing this testing. If I were really in the market for Lego, I really like the ease of going to Amazon, who knew what I am in the market for even me without searching there and showing me those products. This is the kind of thing I talked about in my post on Behavioral Targeting and Affiliate Marketing. I think this is a brilliant idea. If what I saw (Lego Targeting) just a chance, I won’t be surprised if Amazon and other will create their own min Behavioral Targeting networks in near future. eBay is another company which has a huge eco-system and can create a powerful behavioral targeting network. Have you noticed something similar on Amazon and Toys"R"Us? Any other sites? ZeroDash1, was one of the Web Analytics consulting companies named in a Forrester Research’s latest report by Megan Burns, titled "Where to Get Help with Web Analytics." “Our work empowers the marketing professional." Companies everywhere are allocating resources to developing effective Web sites, says O'Donnell. [GL1] She points to Web analytics as a specific, cutting-edge job choice. "Companies need people who can make their sites easy to navigate and visually impactful, so Web analysts need to understand human psychology and also be slightly obsessed with the Web," she says. As people make a decision about their career one of the questions that everybody has on their mind is “What can expect in terms of money?” To answer this question I conducted a salary survey a few months back. In this post I am going to post the result of that survey. I would like to thank all of you who participated in this survey. I had total of 102 responses from web analysts around the world. I did not have enough data to show salary results for any other country except US. In future I will conduct a survey for a longer period of time to get more data from other countries as well. Every position except the Director had siginificant number of respondents. So when you look at these numbers keep that in mind that salary for Director level might not be a true representation of the actual salaries. Average salaries and bonus for web analytics positions ranged from $31,000 to $212,000. Most of the people with Analyst titled had 0-2 years of experience. It appears that as these Analysts get more experience and transition into Sr. Analyst their salaries jump significantly (+42% on average). Over 57% of the respondent had bonus along with the base salaries. Bonus was a component of total package at all the positions. Sr. Managers seem to have higher bonus than people with Director Title. Since there were very few “Directors” who participated in the survey I am not confident that these numbers truly represent the current market salaries. (I encourage you to participate in next survey that I will conduct to make sure we have enough data points). As expected salaries increased with the years of experience. Median salary of “7 and Above” year was below median salary of 5-7 year of experience. I think the cause of this was that a lot of people with experience in other fields made a move to Web Analytics. Their salary in web analytics is higher than what they were making in their previous jobs but still below that of others who have been working in web analytics or marketing fields. % of compensation in bonus grows with the number of years of experience. So do you fall in this range? What would you like to see in future surveys? Leave anonymous comments if you don’t want to disclose your name? Please contact me at batraonline at gmail.com to get a PDF copy of this report.